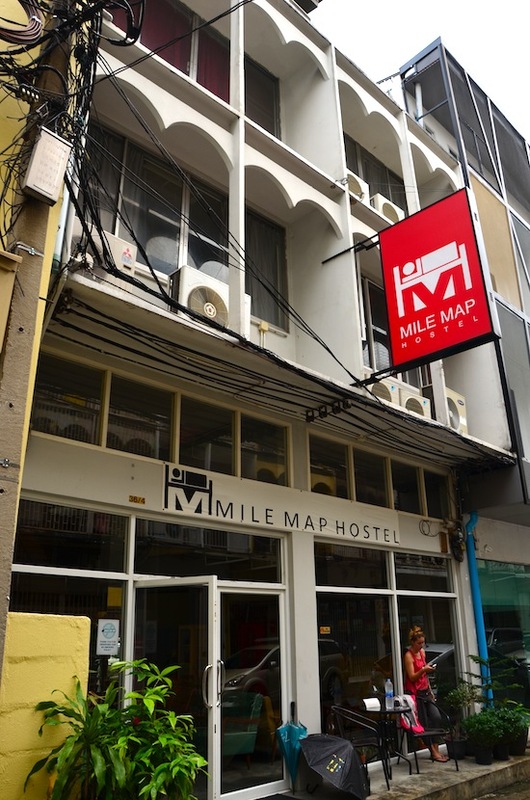 Opened in 2012, Mile Map Hostel dishes out some of the cheapest dorms that we’ve come across in the Silom area. While it only scores average points in just about every category, travellers on a shoestring budget should be satisfied here. Ad Book now! Rates from US$16.03++. Average rating 8.2 from 251 reviews. We dig the high ceilings. The best part about the four-storey building is an airy ground-floor common room with multiple sofas, tables, free WiFi, maps, books, communal computers and a TV. There’s also a small rooftop chill space for smokers. Meeting other people should be possible, but Mile Map is best-suited to travellers who prefer to keep to themselves — there’s no real sense of community here. The urban-style design incorporates a lot of polished concrete with hardwood touches and splashes of colour here and there. Though furniture looked to be more lived-on than when we first discovered the hostel, the building still looks to be well kept. On one visit we met a helpful staff member who spoke excellent English, but more recently we encountered a younger lady who spoke minimal English and didn’t seem thrilled to put down her smartphone for more than a minute. Available in 10-bed mixed or four-bed women-only, the no-frills air-con dorms provide a fair amount of space between steel-frame bunks spread over tile floors. Each bunk comes with a thin matress, personal reading lamp, electrical outlet and use of a locker. Shared hot-water bathrooms with shiny stainless-steel basin sinks are ample in size and segregated by male and female. Quite a bit of space in here too. Mile Map had actually lowered its rates since our first visit. 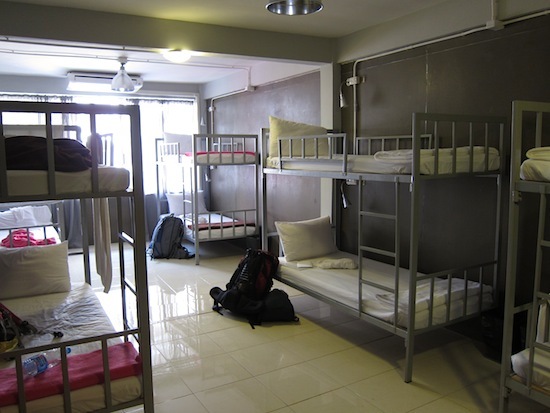 In late 2015, mixed dorms were going for just 250 baht a night, tying New Road Guesthouse for the cheapest dorms in the area. Between the two, we’d opt for Mile Map because its bunks come with reading lamps and outlets. But don’t get angry at us if you stop by to find the dorms going for 300 baht; the staff member we spoke with wouldn’t give us a straight answer when we asked if the 250 baht rate was permanent. Even at 300 baht, Mile Map is still cheaper than nearly all of its Silom area competitors. Mile Map also offers a handful of private rooms representing similarly solid budget value. The cheaper privates with shared bathrooms are seriously basic — nothing but soft mattresses on simple wooden frames — and they’re quite dark and gloomy compared to the dorm rooms. They do have air-con, however, and it could be a lot worse for just 600 baht. On the upper floor, a more upscale private with double or twin beds, air-con, TV and ensuite bathroom is rather more inviting. Situated a stone’s throw from Silom Road on a stumpy alley behind Sri Maha Mariamman Temple in an area with substantial Southern Indian influence, Mile Map enjoys an excellent location. The intriguing Kathmandu Gallery is across the street, and either Chong Nonsi or Surasak BTS skytrain stations are about a 15-minute walk away. Also within walking distance are Neilson Hays Library and abundant street food on Silom Soi 20 and Charoen Krung Road. A 15-minute walk to the west will bring you to a Chao Phraya express boat pier. Do take advantage of the area’s great Indian food. If you’d prefer a more homely hostel with more consistently friendly vibes, head over to Cooper Hostel or PanPan Hostel in the next alley over. Opt for Saphai Pae if abundant common spaces are what you seek, or drop by Lub d Silom if you’re after a rocking social scene. 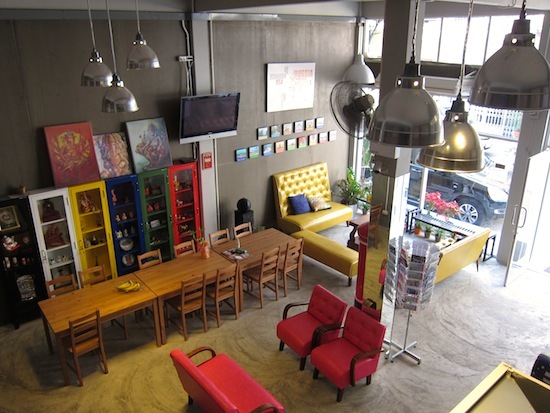 For a slicker urban-style hostel, head further east up Silom Road to HQ Hostel or The Cube. Last updated on 8th August, 2017. Check rates at Mile Map Hostel on Booking.com.